Above Trailing Rosemary has been forced by its surroundings to grow up a four foot lamp post. It is also growing around and over a miniature red rose bush planted near the post. 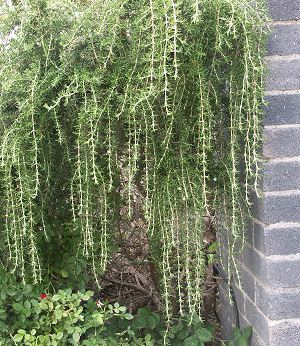 A vigorous grower, Trailing or Creeping Rosemary climbs over itself and easily reaches heights of three feet or more if not pruned. Planted in a second story window box, it would trail all the way to the ground. 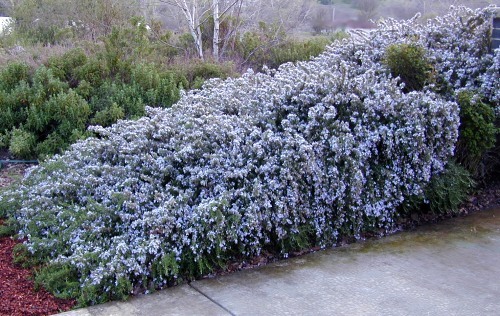 Rosemary is a winter blooming plant that sets its buds over the summer. If pruning is needed to shape the plant, be sure to do this right after it has finished blooming. This plant is often available in plug trays. These trays hold 128 of all the same plant. They are a great low cost way to fill a lot of space. Each cell is 3/4 of inch by an inch. Check here to see if Trailing Rosemary Plug Trays are available.